Posted on November 2, 2018 by Mike Sonnenberg Posted in Train Depots	. 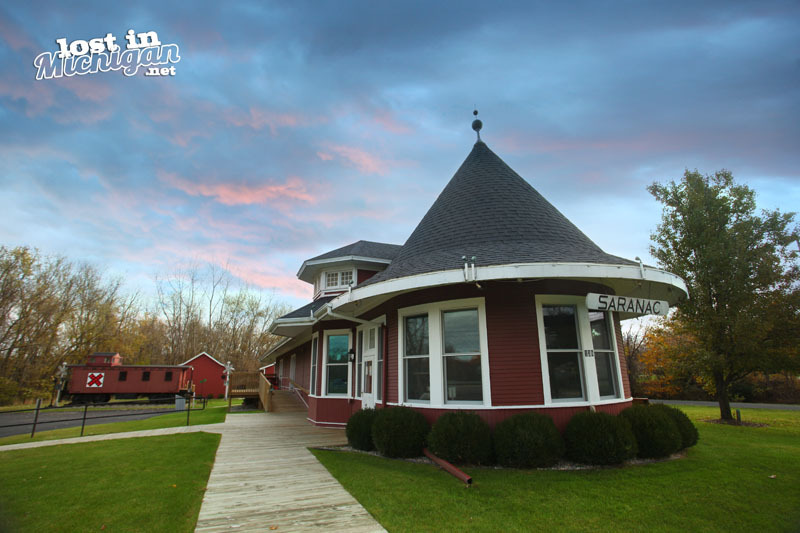 I crossed over the grand river in the town of Saranac, and I saw the dark red train depot with the conical roof. I had to stop and get a pic of it. The historic depot was built in 1907, and served the town until the 1950s when cars and trucks became the preferred method of transportation. The dilapidated depot was purchased by the historical society in the 1990s who restored it and moved to its current location. I got a long look at the old grand old depot, when I went to leave after taking pics of it, my old minivan would not start. I guess I should have taken my jeep but you know what they say about hindsight. Thanks to White Knight Towing for the tow, and to Young’s Chrysler in Ionia. they squeezed me in and getting two techs on it to change my fuel pump so I could get back home. One thing I have learned in my travels around the mitten state is there are a lot of nice people in this wonderful state. P.s. I made good use of my downtime and wrote this post while waiting for my car to be fixed. Good thing I have my books on sale this weekend. I hope you will consider getting one since I have a new fuel pump to pay for. Posted on October 19, 2018 by Mike Sonnenberg Posted in Train Depots	. 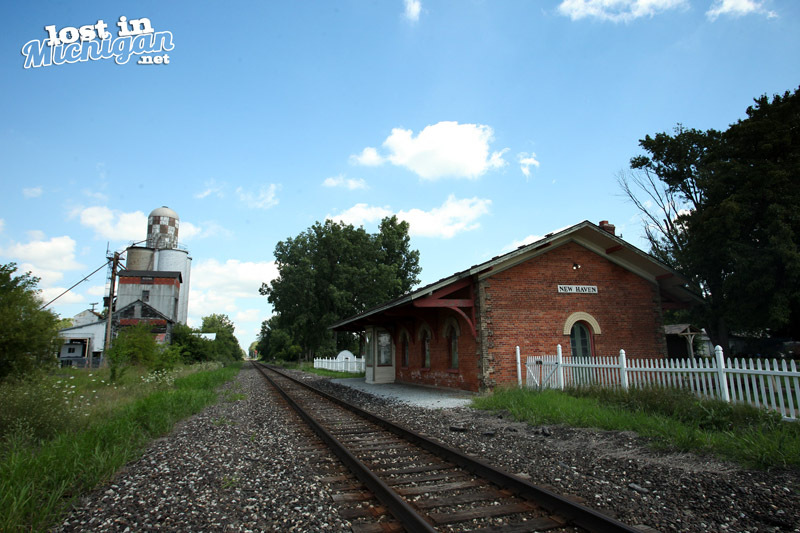 In 1865 the Grand Trunk Railroad built a station to service the town of New Haven in southeast Michigan. It was along this route that a young Thomas Edison worked as a “News Butch” selling newspapers and snacks to passengers riding on the train. In 1940, on a publicity tour for the movie Young Tom Edison, Mickey Rooney, who played Tom Edison in the movie, took an 8 car train from Port Huron to Detroit. The train made various stops along the way, including the New Haven Depot, where he was greeted by over half the village. While the train was moving, Mickey Rooney, dressed as Tom Edison, walked through the train hawking newspapers, candy, etc. just as Tom had originally done. Passenger trains no longer stopped at the little depot after 1954, and by the 1990s the railroad no longer used the station. It was sold to a nonprofit group who renovated it and is now used as a museum. Posted on September 30, 2018 by Mike Sonnenberg Posted in Thumb, Train Depots	. 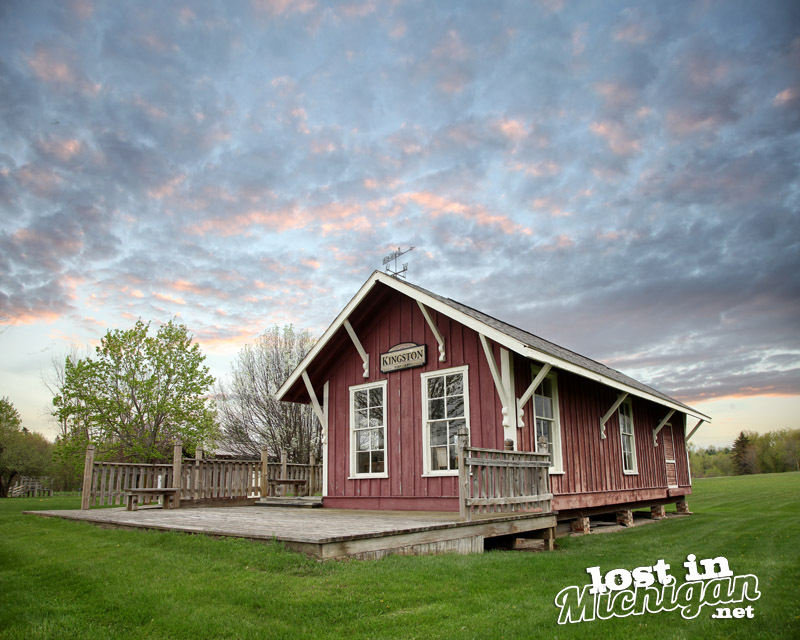 An old train depot stands quietly in a park near the town of Kingston. I stopped to take a photo and that is when I read the sign telling its amazing story. The citizens were proud of their little depot, and were excited when it was completed in 1893. It put the little town on the map now that the train could stop and drop off supplies. Passengers could ride the train to the big city of Caro and beyond. Over time as cars and trucks replaced the need for trains, the little depot was dismantled and stored in a barn near Cass City. A century after it was built, it was discovered sitting in pieces in the barn in 1993. Citizens raised money and had the little depot reconstructed on this site in the park. Next week I will be giving presentations in Caro and Lakeview Libraries. I hope you can stop by and see me. I will have books and calendars for purchase after my presentation, if you can’t make it I hope you will consider ordering books from my website HERE. Posted on July 19, 2018 by Mike Sonnenberg Posted in Train Depots	. I was in Grand Haven and I saw an enormous steam locomotive on display and my first thought was, ” that looks like the Polar Express” but I knew it wasn’t since the 1225 is in Owosso. I looked at the number and it was the Pere Marquette 1223. I wondered what holiday that was and looking on Wikipedia it says that December 23rd is Festivus. Maybe someday the old train will be restored to working order and I can air my grievances on the Festivus Express, I wonder what town it would go to on its journey. Posted on March 22, 2018 by Mike Sonnenberg Posted in Train Depots	. 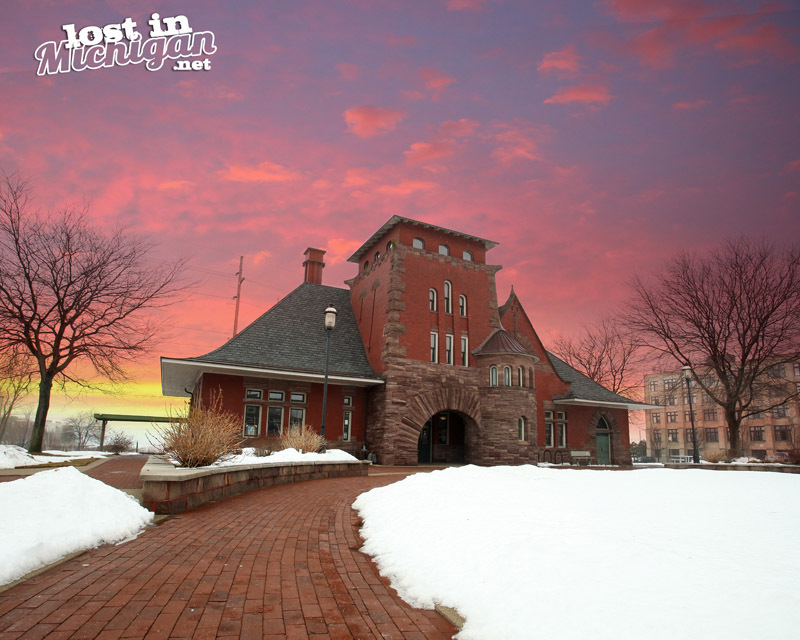 The Union Depot was opened in 1895 to serve the Chicago & West Michigan Railway; The Muskegon, Grand Rapids & Indiana Railroad; and the Toledo, Saginaw & Muskegon Railroad. A.W. Rush and Son of Grand Rapids designed the Richardsonian Romanesque station. Several national political figures paused at the depot during whistle-stop campaigns. In 1896, William Jennings Bryan stopped during the first of three unsuccessful presidential bids. The 1952 campaign brought Republican vice presidential candidate, and future president Richard M. Nixon to Muskegon as well as President Harry S Truman who stopped on behalf of Democratic presidential candidate Adlai Stevenson. The Union Depot closed in 1971. 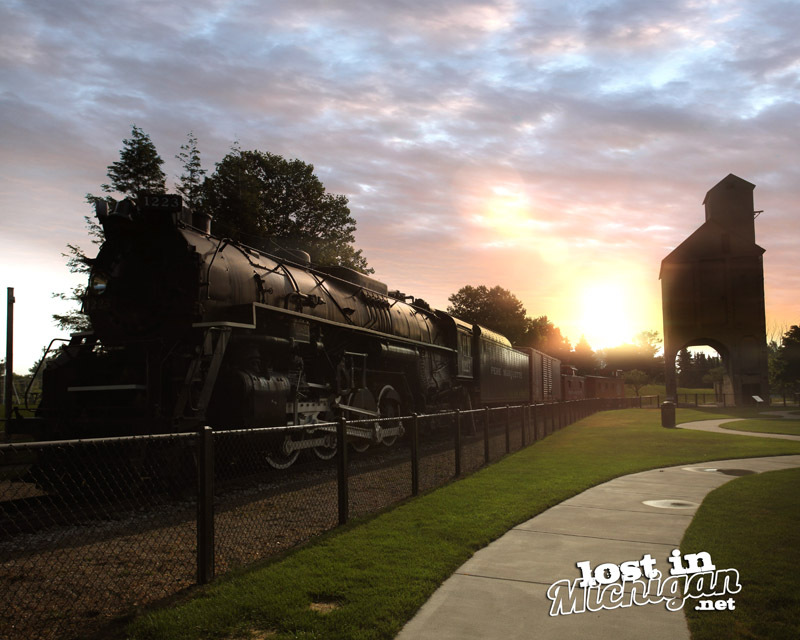 It was donated to Muskegon County in 1992 and restored as a visitors’ center and museum. P.S. I don’t think I would have lasted long in the “good ol’ days” I don’t know how they lived without the internet and modern plumbing. Posted on December 20, 2017 by Mike Sonnenberg Posted in Train Depots	. I love this little red depot in the middle of downtown Dryden. It seems a little out of place but then after reading the Historical Marker in front of it, I know why. This area now known as Dryden was settled in 1834. By 1880 it was a hamlet of about 300 people. A marketing center surrounded by rich farm land, it turned to the railroad to increase its prosperity. Its citizens, spurred by the Local Ladies Library Association, contributed $11,000 to help defer construction costs in order to bring the railroad to Dryden. On October 3, 1883, the Pontiac, Oxford, and Port Austin Railroad passenger train rolled into town. Over 500 spectators, the Thornville cornet band and a cannon were on hand to salute the train. 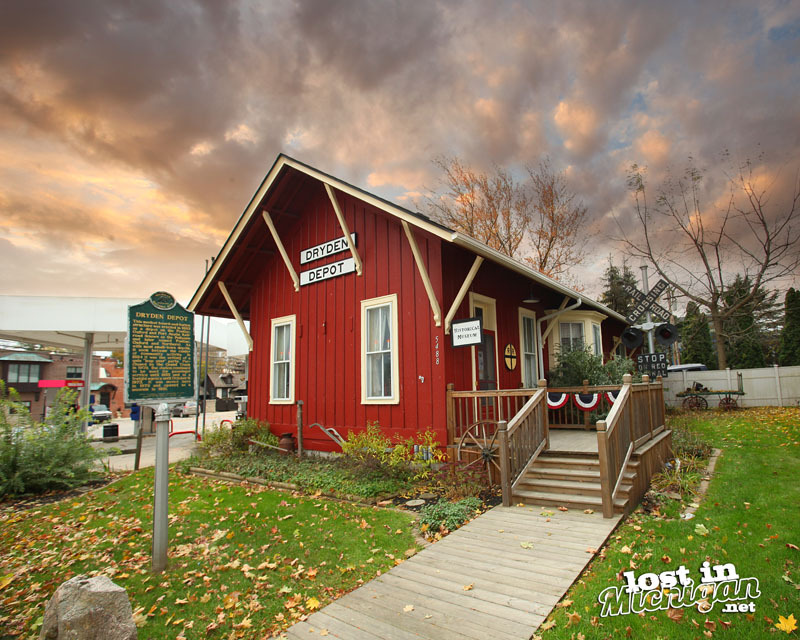 This modest board-and-batten structure was erected in 1883 as a depot on the Pontiac, Oxford and Port Austin Railroad (known as the Pollyann and later named Pontiac Oxford and Northern). 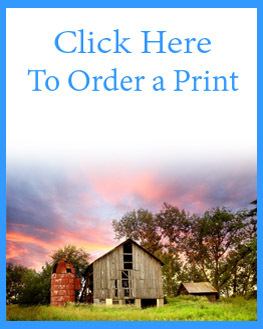 As with most small-town depots, it soon became the center of community activity. In 1884 it was the setting of a gala “leap year” party. 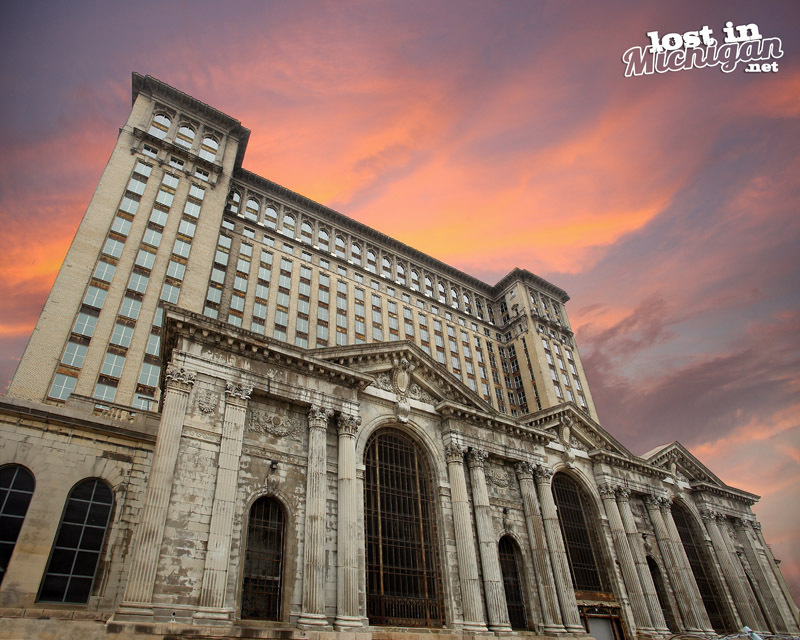 Purchased by the Grand Trunk in 1909, the station continued to be used for passenger service in 1955 and as a freight agency until October 9, 1973. It was moved here in 1970 and opened as a museum in 1981. This Saturday I will be at Charlin’s Book Nook in Frankenmuth selling and signing books. If you’re in the neighborhood stop by and say hello. Posted on December 14, 2017 by Mike Sonnenberg Posted in Train Depots	. I took this photo from the other side of the tracks on a freezing cold Michigan evening, but I love the way the Durand Union station looks all decorated for the Holidays. Built in 1903 by the Detroit firm of Spier and Rohns it had a high volume of rail traffic as the Grand Trunk Western and Ann Arbor railroads crossed in Durand. It was almost destroyed by fire in 1905, but quickly rebuilt. At its peak, 42 passenger, 22 mail, and 78 freight trains passed through Durand on a daily basis and it serviced almost 3,000 passengers a day. In 1974, Grand Trunk Western decided to close the station due to declining traffic. 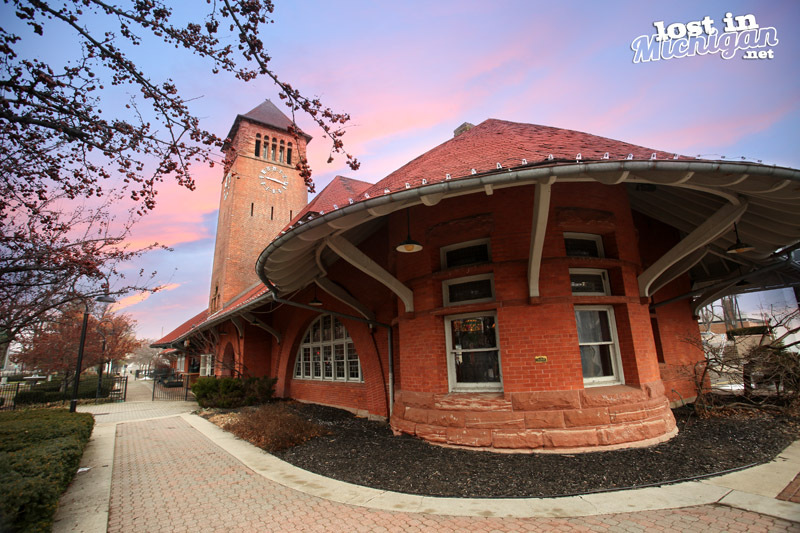 The historic building was going to be torn down, however, the city of Durand filed for an injunction to stop the demolition and eventually purchased the station in 1979 for $1.00 and I think it was the best one dollar investment in the state of Michigan. It’s still used as an Amtrak Station, I would love to get a ride on the Polar Express from this station. Maybe someday it will stop there. Posted on November 22, 2017 by Mike Sonnenberg Posted in Train Depots	. 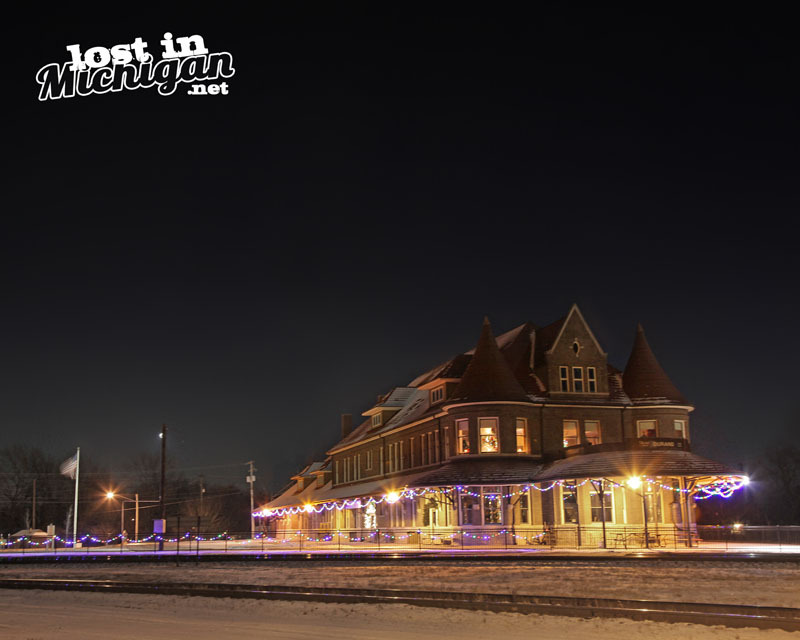 The Michigan Central Railroad Depot opened on July 27, 1888. Rogers and McFarlane of Detroit designed the depot, one of several Richardsonian Romanesque-style stations between Detroit and Chicago in the late nineteenth century. Thomas Edison as well as Presidents William Howard Taft and Gerald Ford visited here. The depot was acquired by the New York Central Railroad in 1918, Penn Central in 1968 and Amtrak in 1970. The depot was listed on the National Register of Historic Places in 1971. A much as I like driving around the state I have always wondered what it would be like to travel the state by train, I guess i was born a little late for that. Posted on August 24, 2017 by Mike Sonnenberg Posted in Historic Places, Train Depots, Uncategorized	. 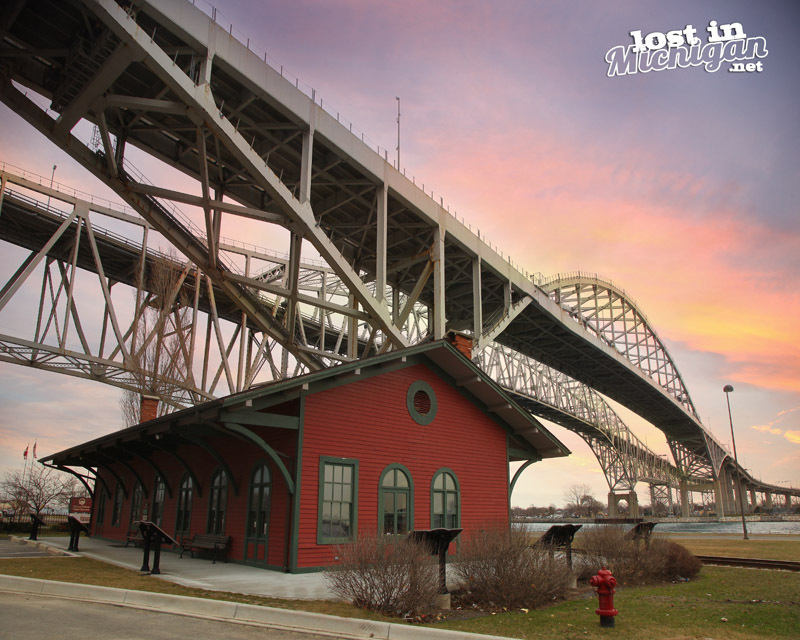 Underneath the Blue Water Bridge in Port Huron is the old Grand Trunk Railway Depot built in 1856. This is the depot a young Thomas Alva Edison worked at while selling newspapers and books to passengers. This is the part where I am supposed to write about Edison’s accomplishments, but I am thinking most people already know what Edison did, and how he impacted the way we live with his light bulb and other inventions. I figured I would use this post to thank you for taking the time to reading what I write. I happened to look at my stats and this is my 500th post. Yeah I know some posts are better than others, and my “writing ain’t too good” but I think I have gotten better than when I started. I have always been kind of a geek or nerd or whatever you want to call it. I don’t follow sports, and I could not tell you how many home-runs Joe Namath has, or how many touch downs Kareem Abdul Johnson made, but I do know who the first woman to get her pilot’s license is. Harriet Quimby born in Arcadia Michigan if you’re wondering. I have always admired people who move society forward and contribute to making this world a better place, people like Sojourner Truth, L. Frank Baum, Bina Mae West, and William Livingston. 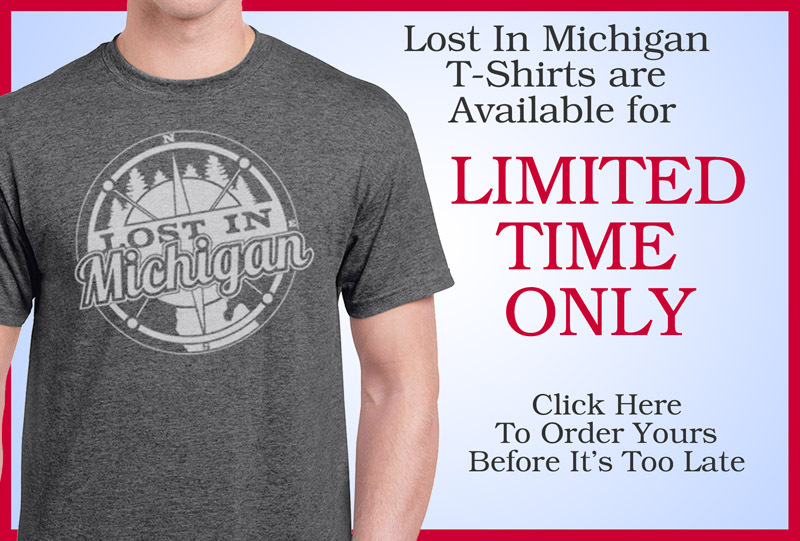 I have always had a curious mind and would rather go out and explore Michigan than play golf or go wine tasting, not that there is anything wrong with that, but the typical tourist stuff does not appeal to me that much. I have always thought I was alone in my passions, but since I have been posting stories on this website I have found there are a lot of people who have the same curiosity that I do. Thank you all for following me. I am looking forward to my next 500 posts. I hope you will come along for the journey. P.S. If you have a friend that you think would enjoy what I post, I hope you will share my website with them.